Every third Friday of the month the Blue Monk (3341 SE Belmont) hosts the Offbeat Belly Dance collective, a club rocking, good timing, genre-defying gang of badass belly dancers. 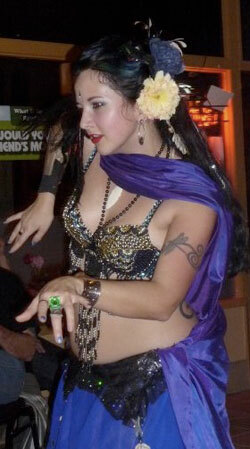 This Friday, February 17, 2012 is now exception: Offbeat Belly Dance! Inaugural 2012 Edition! Fun! Fabulous! Free Show! his Friday! Come share the love as Offbeat Belly Dance once again sallies forth to commandeer The Blue Monk’s basement stage, hellbent on bringing you only the very best in alternative, experimental, and maybe even traditional belly dance! We also are giddy with anticipation of two rock ’em sock ’em totally awesome troupes who will be joining us (it’s a troupeapalooza)! Get here early and get a good seat! Noble Portlanders, you need to get some of this awesome. Join us. You deserve to be a part of the magic, and the evening just won’t be the same without you. Join us! Bring your friends! Bring your party hat and your dancing shoes and we will bring our awesomeness and our ninja skillz. As always, the show is FREE! As always, the show is AWESOME! Viva Offbeat! See you Friday! Wooo! Join Karissa, the Ringleader of Offbeat Belly Dance (pictured to the right), and the other fabulous dancers at the show Friday night. Individually, the members of the Offbeat Belly Dance collective perform at shows throughout the Portland area, but on the 3rd Friday of the month they come together at the Blue Monk to perform in a rollicking belly dance revue. One of the things that makes it offbeat, is that the dancers choose whatever kind of music they like. Karissa tells me this has included traditional Middle Eastern music, zydeco, AC/DC, Strauss, The Pogues, hip hop, jazz, blues, Old Crow Medicine Show, the Spice Girls, and just about everything else. The shows are free, and go from about 7pm until 9:30pm.